Model Name: Seamaster 300 "Military"
Signed: Case, dial and movement signed. Caseback further engraved "0552/923-7697 A/199/69". Accessories: Accompanied by an Extract from the Archives confirming date of production on March 13th, 1968 and delivery to the British Royal Navy, and Royal Navy Divers Log belonging to J.B. Fisher with photograph of "H.M.S. GANGES". The necessity of creating waterproof and reliable timepiece for divers would soon inspire watch brands to introduce many competing dive watches, a few of which, including Omega’s Seamaster 300, are now considered icons. Omega introduced the Seamaster 300 in 1958 as part of their “Professional” line of watches. 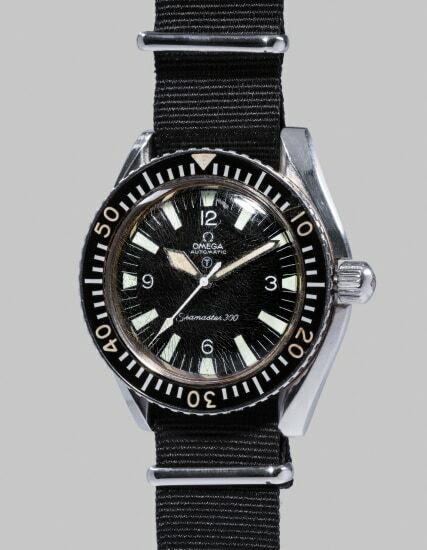 Whilst the vast majority was produced for professional and recreational divers alike, from 1967 until approximately 1970, a very small batch was made for military use and custom designed by Omega to meet the needs of members of the British Army and Royal Navy. A number of special features set them apart from Omega’s regular production units. Their cases, with distinctive curved and beveled lugs, were delivered with fixed spring bars. Dials featured an encircled “T” designation, signifying the use of tritium for the luminous hour markers and hands. The broad, sword-shaped hour and minute hands, as well as the angular sweep seconds hand, were also specially designed. The crown was screw down as opposed to the snap down design as found on production versions. Their case backs were engraved by the British Ministry of Defense with the military branch code, issue number, and year of issue. As many were used in combat and on military deployments, very few have survived with all factory military features intact. We are therefore thrilled to offer this piece in its full “mil-spec” configuration. Surviving in remarkable original condition, it is one of the finest and best-preserved examples of a military Seamaster 300 to appear on the market which is even more impressive considering its regular use through at least 1971 by a diver of the Royal Navy. The caseback engraving of 0552 indicates delivery to the Royal Navy as confirmed by the extract from Omega’s archives. The original owner kept meticulous records, and his dives are wonderfully documented in the original Royal Navy Divers Log accompanying the watch. The dial is original to the watch, still fitted with what’s known as the “thin” encircled T. Most SM 300 dials were replaced during use by the MOD, and can be found with “fat” encircled T’s that were reprinted by the MOD. The luminous have faded to a pale yellow, which match the hue of the luminous numerals on the original acrylic bezel. Even the original NATO strap is fitted. This military Omega Seamaster 300 wristwatch is a rare opportunity for collectors of sports or military watches to own an extremely rare and completely original example of one of Omega’s most sought after divers watches. Case, dial and movement signed. Caseback further engraved "0552/923-7697 A/199/69". An extremely rare 14k yellow gold chronograph wristwatch with tobacco-brown "tropical" subsidiary registers and bracelet, retailed by Tiffany & Co.
An extremely rare and highly important yellow gold perpetual calendar chronograph wristwatch with moonphases and bracelet, retailed by Tiffany & Co.
Model: Oyster Prince Submariner "Snowflake"
Model: "La Rade de Genève"
A fine and rare stainless steel wristwatch with date and bracelet, retailed by Tiffany & Co.
Model: GMT-Master "U.A.E Quraysh Hawk"
Model: Cosmograph Daytona "John Player Special Paul Newman"
A fine, rare, important and probably unique 14k yellow gold chronograph wristwatch, retailed by Tiffany & Co.
Model: Autavia "1163MH-2nd execution dial"
A fine and rare stainless steel wristwatch with date, bracelet and centre seconds, engraved with "Grand Prix de Monaco 1992"
Model: Oyster Chronograph Antimagnetic, "Jean-Claude Killy"
An extremely rare, important and attractive 18K gold dual crown world time wristwatch with 24 hour indication, retailed by Tiffany & Co.
A highly exclusive and very attractive yellow gold perpetual calendar wristwatch with moonphases and "red dot" leap year indicator, retailed by Tiffany & Co.
A fine and rare yellow gold traveller's wristwatch with separately adjustable hour hand, retailed by Tiffany & Co.
Model: "Montre de poche à heures sautantes"
Model: Oyster Cosmograph "Paul Newman", also known in literature as "The Legend"